This tour was one of the highlights of our travels through New Zealand and the credit has to go to our excellent guide, Bronwyn. She did a great job guiding us to the essential Rotorua highlights and efficiently using our time there. The sights were all great to see but I think the best part of this tour was that Bron was able to give me some insight into the character of the New Zealand people themselves and how it was shaped by their history and culture. We had a wonderful day with Paul Marston at the wheel of our bus. He livened the sights with his own special brand of commentary from the time we pulled away from the dock until our return several hours later. Had an amazing day at Rotorua with our guide Paul who was very knowledgeable. On the way there we visited a kiwi farm which was very interesting. At Rotorua the mud pools and geysers were spectacular and we thoroughly enjoyed the visit to the workshops together with the Maori culture show. Unfortunately there was insufficient time to look round the excellent gift shop. All in all a great day out. Lack of topical local read tourism information. Poor pre tour information, particularly regarding meeting times. An enjoyable trip, but felt that some of the tour was a little rushed. Don't attach any blame to the tour guide, who has to work within time line of ensuring we are all back to ship on time. As a result one item of the tour was missed. This was a fantastic tour. Our tour guide was knowledgeable, very friendly, took us to more places than were listed and because of his contacts at each attraction we didn't have to queue. Enjoyed this tour and Sandy our guide and host was around early in the morning outside the port gates to greet us. There was about 12 of us in a mini bus and it was comfortable. The drive to Tauranga is over an hour, sometimes over beautiful countryside. Brian is very informative and has a witty and cheeky sense of humour - all good on a long journey. 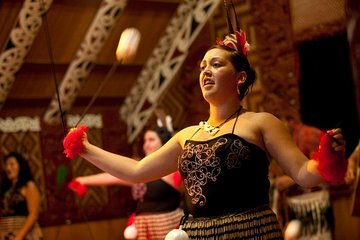 At Rotorua we not only get to see the famed thermal springs and walk through the park area, we take in an Indigenous show of dance, songs and performances from the local Maori landowners. Very interesting! Lunch at the lake was standard cafe fare. 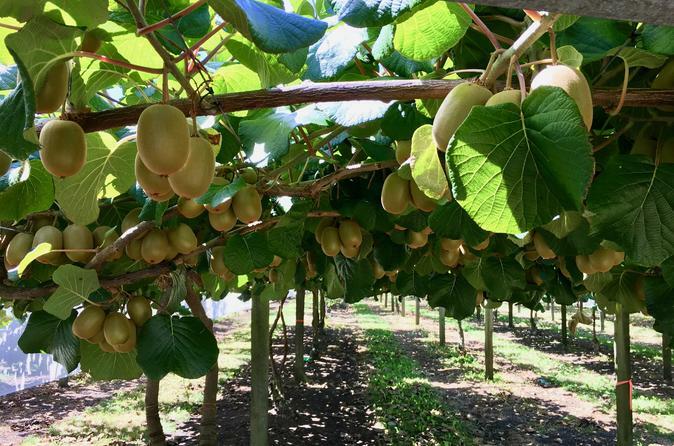 On the way back we stopped at one of the large Kiwifruit farms and the ice cream was heavenly and free! Well no so as we were told on leaving the farm that the staff mistook us for another tour that had ice-cream tasting included but not ours. Sandy like a good driver made haste to the ship! On the way back Sandy took the scenic coastal strip where elegant homes lined the shores, the magnificent beaches with rolling surf no doubt the main attractions. This was a small group tour of Rotorua with direct pick-up from our ship in Tauranga. The guide was knowledgeable and fun, and with the activities undertaken and the amazing sights encountered, we had a most enjoyable day. This tour is highly recommended. Small intimate groups are always better then big bus tours.